Oh Contraire my good buddy? Or as Lee Corso says: “not so fast my friend”! With that in mind: I followed the link and placed my order for Factory tools Set 1, and I received an order conformation within 24 hours and a shipping conformation within 48 hours and They were in my mail box today a mere 8 working days after I ordered them, considering its half way around the world? That’s pretty fast to me! I might need one or two to "raid for parts" then maybe another one in some state of repair or disrepair! PS -- It IS a German prototype ... but I'm not that fussy ... more interested in the level of detail than, say, an obvious Chevy/Ford ... at least until the selection improves. PPS -- I really DON'T expect this to turn into a VEHICLE thread ... but something like this with all the various chassis components can become a source of detail bits ... separate doors, hoods, chassis, motor = junkyard, repairs, etc. For me modelling Post-War German industrial narrow gauge this is just the sort of thing I would be looking for . In addition to the ever increasing number of lorry kits that are becoming available ,there are a number of similar car kits out there that would be quite suitable for me . I already have a Bronco Light saloon ( I forget which vehicle it is based on ) , the ubiquitous Tamiya Opel Blitz and a Azimut Productions resin Ford 917G truck so I'm well set up . Just need to find time to build them . That's another one that looks like a good "parts source" in addition to being a useful truck ... base for a tow truck, etc. Paul Napier has just sent me this promo photo of a newly-announced Trumpeter 1:35 kit. Ooooh Shiny. me want. Crawler running gear, louvre panel mouldings, radiator, headlights -- lotsa useful bits. That's why it smelt so bad"
The older versions of the S60 certainly were -- see the Plus Models resin kits -- but this machine looks to me more to be "inspired by" mid-30s Cats. It's somewhat different when you start comparing details and, I think, larger than a Cat 60. Probably best thought of as raw material for freelancing rather than as the base for a truly accurate model of a western tractor. Picked this up today. 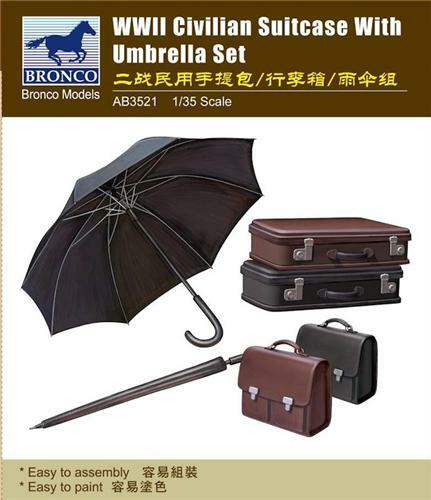 Umbrella would work as a larger sun shade umbrella for on a dozer or critter in 1/48. I'm looking for a supplier of pipe fittings for 1' scale; elbows, unions, valves, faucets, etc. in-the-wall pipes, not chrome bathroom/kitchen stuff. Brass would be perfect, white metal is good, but plastic OK too. Do any "doll house" outfits sell this stuff? Online? paint/finish technique to make it look like brass or bronze? Insofar as coloring, have a look at how Michael Fichtenmayer painted the copper on his Fish Submersible build here in the forum...sim techniques could be used for brass. Paints such as Alclad and Gunze and Rub-n-Buff would IMO all be good osolutions or starting points for brass coloring. Is everyone familiar with the Italeri field tool set? Some good stuff for ~$12 or so. I have mentioned this British company in passing on a few occasions but decided that it was time to give them the dignity of a more formal announcement . Diorama Debris http://www.dioramadebris.co.uk/index.asp basically make silicon moulds to make bricks , tiles and paving from . At the moment the two scales that they have moulds for are 1:16th and 1:35th , with the latter having by far the greater choice . This will soon be augmented by some new moulds to make bricks in either 1/48th or 1/43.5th scales . It is essentially the same mould but will make 1/48th scale standard German bricks or 1/43.5th scale standard British bricks . It have been suggested to them that moulds to make 24" x 12" slates in each of those scales might be worth considering as well . Incidentally , with the new brick mould you can make bricks with or without frogs . Frogs in 1/48th scale bricks ? That's insane . Look at the photos if you don't believe me . Whether anyone is mad , sorry , I mean courageous , enough to construct a whole building out of them time will tell , but they would make great junk/rubble piles . In 1/35th scale there are a number of products in the pipeline that hopefully will come to fruition .As well as the Spanish barrel roof tiles that they already have on their website they will be producings a mould to make pantiles ( similar to the one's on Per Olav Lund's The Backyard diorama ) , beavertail and half round plain tiles . Apart from the Spanish tiles these are more of a European product but as their main market is the military modelling one this is to be expected . There is also talk of producing moulds to make cinder/breeze/concrete , call them what you will , blocks in 1/35th scale and I'm sure if there is the demand possibly in 1/16th scale as well . However , for me the most exiting new mould is one to make rows of Flemmish bond brickwork . This , quite literally , speeds up construction by tenfold . This I have proved with my present project . It took me 7 sessions to lay 900 individual bricks in my old way using HO stripwood as mortar joint spacers . With the new moulds I was able to lay over 1700 bricks in my first session . I have so far laid over 5000 bricks in the same time as the original 900 . The joke is , they look like strips of Lego bricks because they are moulded with spacer blocks to speed up construction . Even if you never buy from this company you still will find lots of useful tips and help on casting on their website . By the way , this bit of brickwork , in 1/35th scale , was done by one of the owners of the company who is not a modeller . And she's a girl as well . So there is no excuse for us tough chaps not to have a go !